Tom Yocum goes topsy-turvy, No Name Rapid. 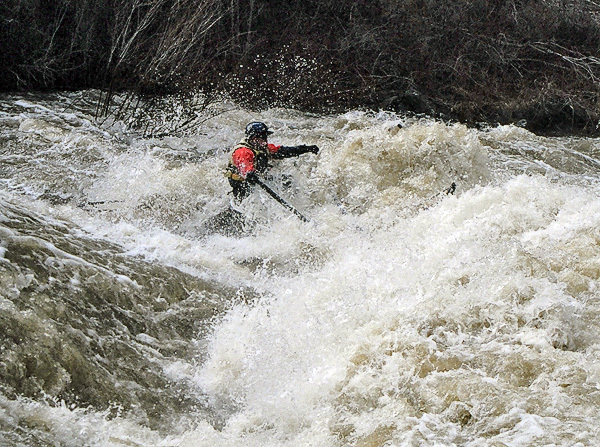 "The best whitewater in Oregon." 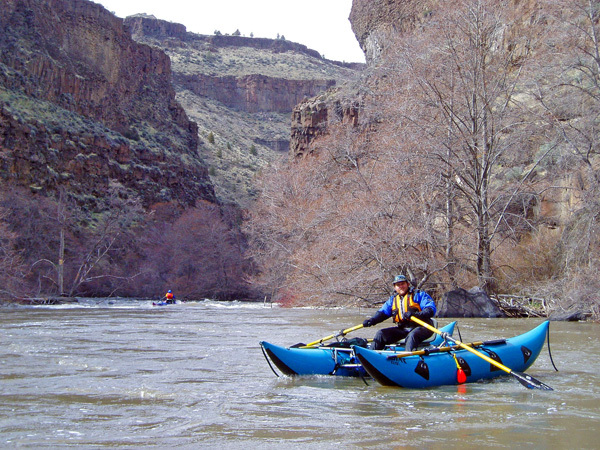 "One of the top five rivers I've ever boated." Trip report by David Chatham. Photos by David Chatham, Val Shaull, and Mark Yauney. What a fantastic weekend. 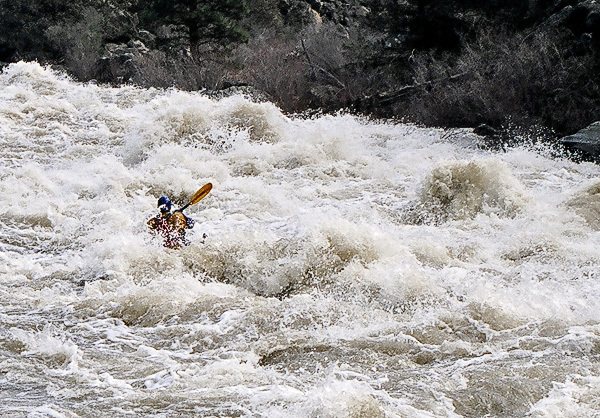 Word was going around that the Crooked might be in for the weekend, and flows during the preceding few days had been at 2025 cfs. Mark Yauney had previously told me that I should be ready to hit the Crooked with a few days notice and that we would likely have the opportunity this year given the high snow pack. The Crooked is a dam release river that rarely runs, and didn't run at all last year. A few days prior to our eventual trip, Val Shaull posted that things were looking good, and that he would arrange for access to the takeout, and would also arrange for shuttle drivers for the vehicles. Val also posted that no IKs should be on the run. 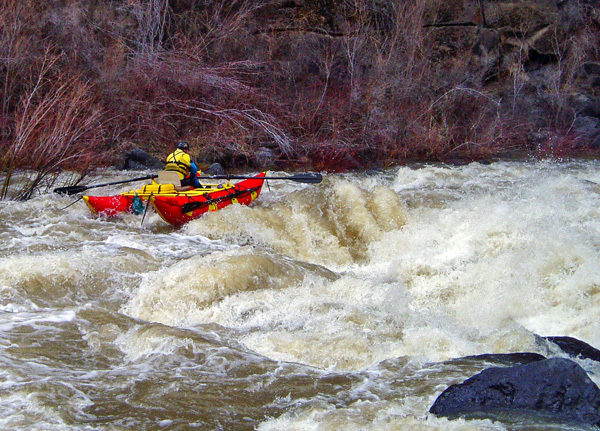 Mark had also informed me that the river was quite big, and that he was going to be taking his cataraft. Now, Mark is one of the strongest IK'ers I know, and I generally trust his opinion, but I was undaunted by the negative thoughts and showed up with Scott Waidelich to make the run. We awoke at 5:30 AM to conversation outside our tent about a pool being taken concerning the number of expected swims the IK'er would have. A most auspicious start for the trip, but all in good humor. It was also time to head into Terrabonne for breakfast, and I joked with Scott that it was good to socialize with the people who might be chasing down our gear. 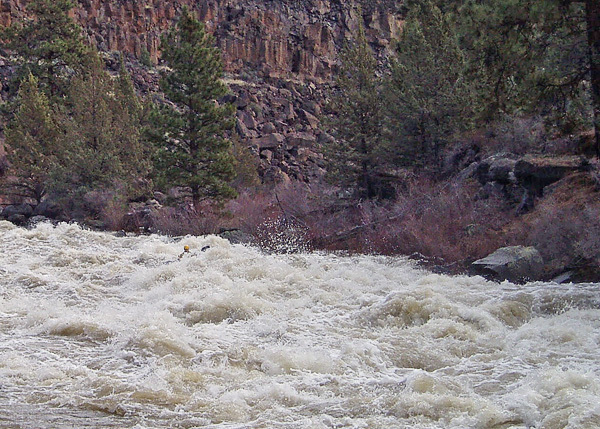 To add to the excitement, the damkeepers had increased the flow that morning to 2454 cfs. 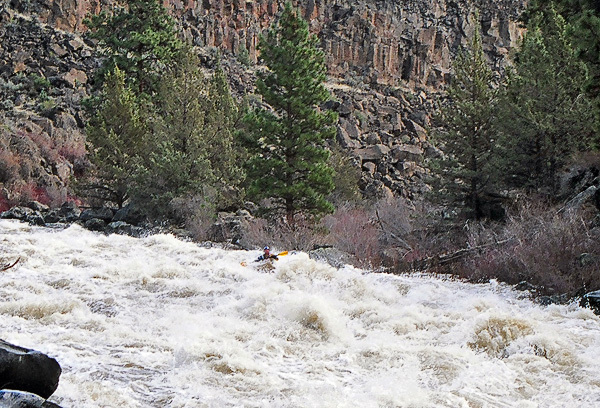 The Paddling Oregon guidebook lists 1000 cfs as the optimal flow for this run (for kayaks). After going to breakfast at the local restaurant in Terrabonne, which was overwhelmed by the sudden influx of a large number of boaters, we headed off to the put in and waited for the shuttle drivers to arrive. We ended up with a large and diverse group of paddlers. 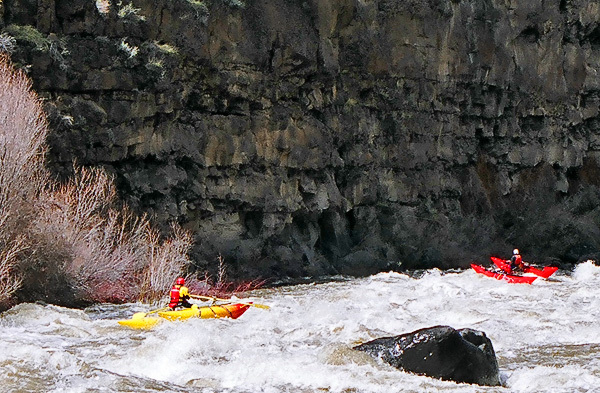 We had Scott and Bryon Scruggs in hardshell kayaks. In catarafts, there were Val, Mark, Eric Klein, Scott Harvey, Will Conley, Hans Chambers, Tom Yocum, Dave Hagmeier, Mike Moses, Bill Gibson, and Steve White. 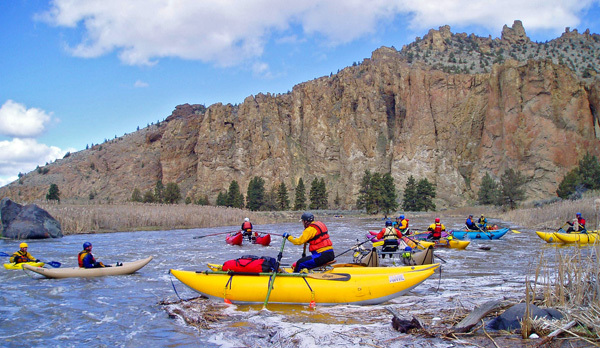 There was also one R-6 paddle team (the Oregon Rafting Team) in a 14' raft guided by Tim Brink with the crew members consisting of Tyson, Laura, Nightcrawler, Mark and Rose. And, finally, there was me in an IK. Mark Yauney had a conveniently placed dry box on his Cat, and was gracious enough to carry my camera for the run. The weather for the day was a little strange. At different times, we had mostly clear skies, mostly cloudy skies, light rain, and, even had a few snow flakes. The first couple of miles on the run were flatwater, and we pushed along with Val setting the pace. Finally, we came to a horizon line with some mist arising on the left side which was the start of a mile long rapid that some of the catboaters call Initiation. Eric and David entering Smith Rocks. 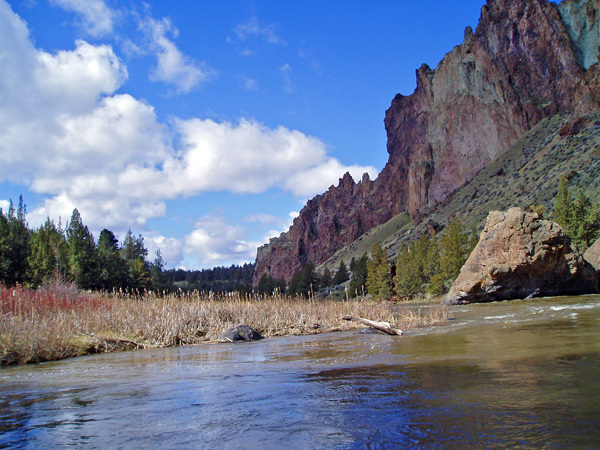 After this, the river again flattens out, and enters Smith Rocks State Park. The scenery here was spectacular with the morning sun hitting the higher rocks, but with a lot of areas still in shadow. There were also a good many climbers either heading to or already on routes. Group bonding on the Crooked. A short distance after leaving the climbing area, we arrived at Rapid Number One. Mark, Eric and I were the last to arrive because we had stopped twice to take photos. 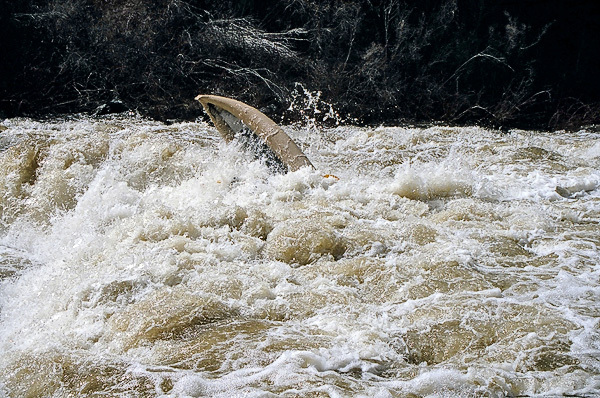 We missed Mike Moses going for a one minute hole ride part way through the rapid. Mark informed me that the line was left of center, after which, he ran the rapid, and set up to take pictures of Eric and I. Eric ran next and did a huge tail stand, but didn't flip. Eric tailstands through Number One while Scott and Bryon look on. Then, I took my turn following Mark's suggested line, and went through some huge drops, and clipped the far left edge of the biggest hole in Number One. I got to the bottom upright, and was surprised to see all the other boaters gathered there, probably to witness my expected carnage. David goes number one in Number One. We arrived at Rapid Number Two after a few more minutes, and as far as I know, everyone ran the right side, and no one had any problems. 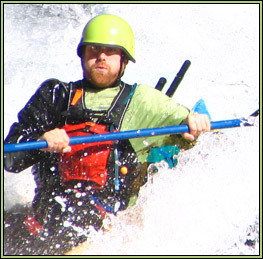 After Number Two, there were some interspersed rapids with big holes, and I did get a flip in the rapid just prior to Wap De Doodle much to my chagrin. 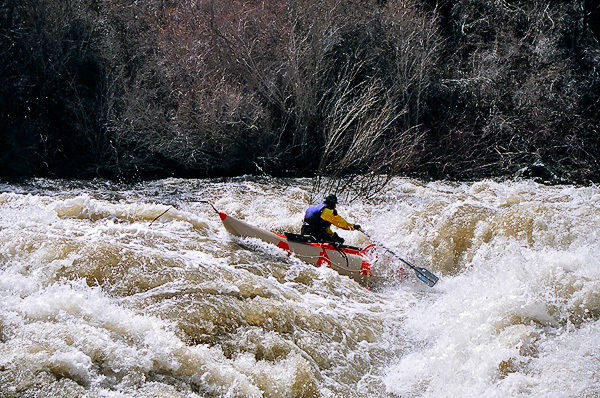 Wap De Doodle had the most intimidating view downstream of any rapid on the entire run. There were huge holes, and about 3/4 of the way down, there was a spot where the water was launching about 7-8 feet up over what might be either a pourover or a haystack. Mark went before me and set up for pictures. I entered center left and thought I would head back to the right and miss the huge upswell. However, the river had a different idea and took me right there. I expected that I was about to be munched, but dropped into turbulent water and not the nasty hole that I was worried about. 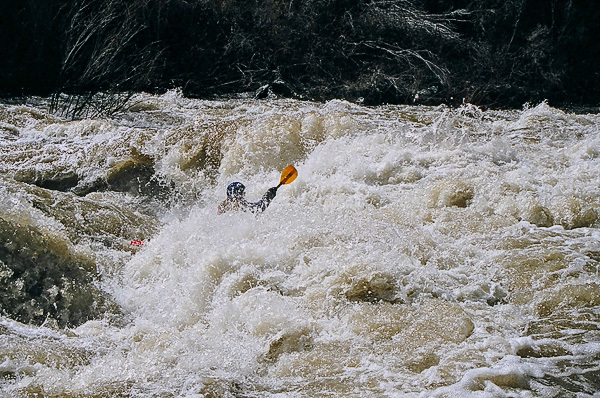 I let out a whoop of joy at the bottom of the rapid and waited for Scott and Bryon to make their runs. David boat scouting Wap De Doodle. 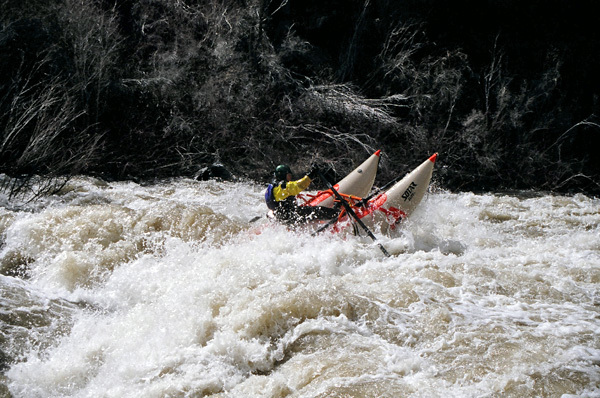 Scott followed my line and mostly disappeared on the downstream side of the huge haystack, but also had a clean run. Bryon took a more conservative line and ran farther right missing the big feature, and also enjoyed his run. Fish runs the maw of Wap De Doodle. More pretty canyon scenery on the Crooked. 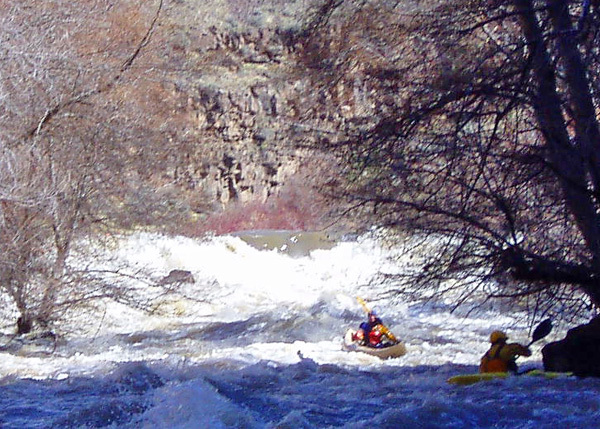 We paddled some more rapids and then saw people scouting on river right, and we knew that we must be at No Name Rapid. 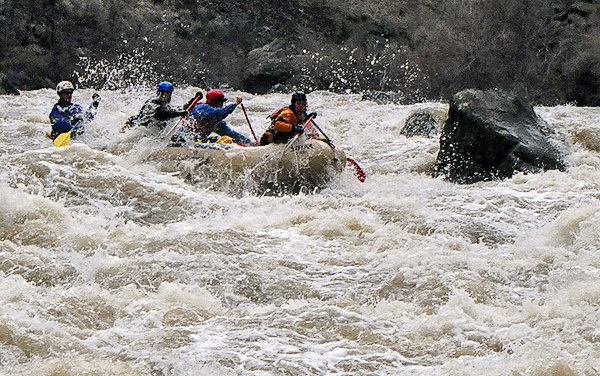 It is quite remarkable that the rapid with the worst reputation on the river doesn't have a name. Most of the catboats elected to take a saner cheat line on the far left, bypassing the hole. Dave Hagmeier and Val Shaull take the smart line in No Name. Bill Gibson sneaks the hole in No Name. 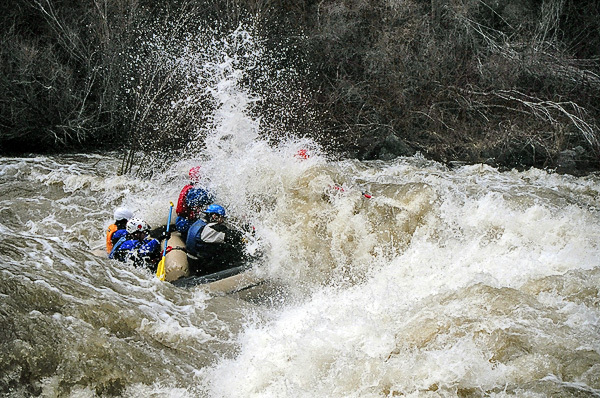 The paddle crew, however, went for the gusto and punched through the huge curler, passing through unscathed. Great job. 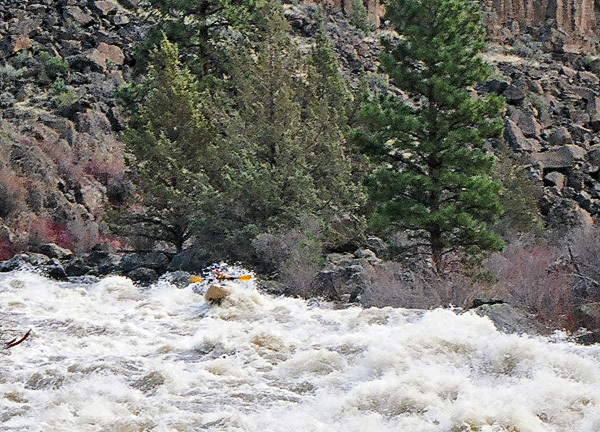 The Oregon raft team goin' for the glory. Tom had a little indecision on his turn and ended up going into the hole with one tube going into the curling wave, and one tube going into the hole. The result was a spectacular endo flip. Tom Yocum practices his pirouette in No Name. Mark Yauney punching through the curler at No Name. I looked at the hole and figured that since there wasn't much below No Name, and with the camera going, why not take the hero line as well. I ended up exactly where I wanted to be, just to the right of the huge curler and to the left of the worst part of the hole, thought I had made it (as had the people observing from shore), when my boat went beyond perpendicular, and I got to practice my self rescue technique. Go big, or go home? GO HOME!!! Everyone then had a quick bite to eat, and we got back on the water. There were some more rapids, and the we arrived at Chinese Dam, where the remnants of a prior dam create one of the most technical drops on the river. The line here was to enter far right, then head towards the center, and finish on the left. 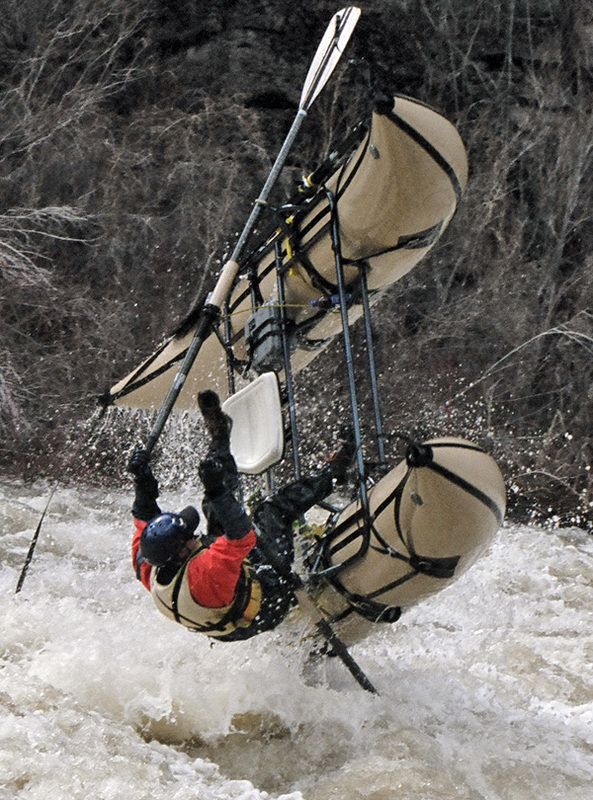 One of the catboaters popped an oar on his run and had a flip near the bottom of the rapid. I believe everyone else did OK with there lines. Fish and David below Chinese Dam. There was one more big standout rapid (The Wave) below this which was entered on the right, but which had two pieces of wood sticking vertically our of the water necessitating leftward movement to avoid them. Everyone did fine here as well. 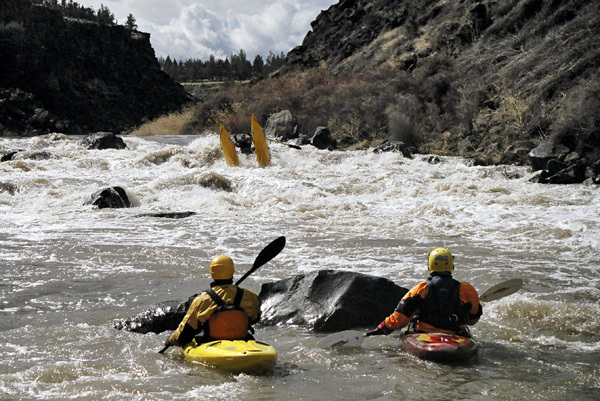 After this, the rapids mellowed to class III, and there was time to take in the beautiful scenery. 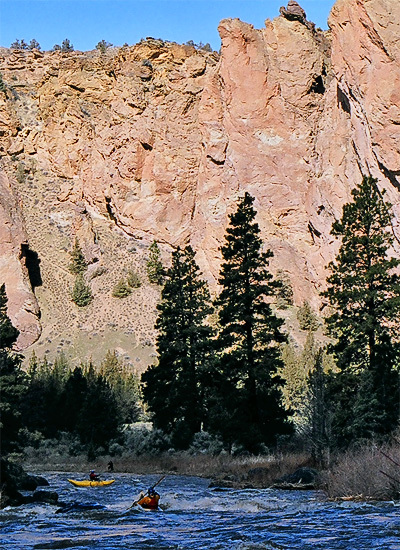 The were 100 foot high basalt columns on both sides of the river, and many springs were coming out of the left wall. There were also some places where there were low clearance tree branches that had to be avoided. 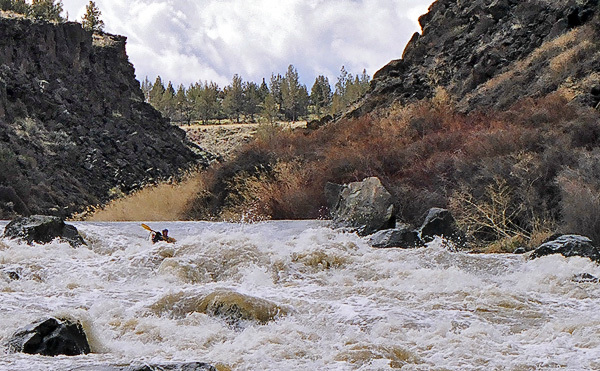 Scott Harvey basking in Crooked River bliss. When we got to the takeout, our cars were waiting for us for the very steep drive (26 degree grade) to get out of the canyon. 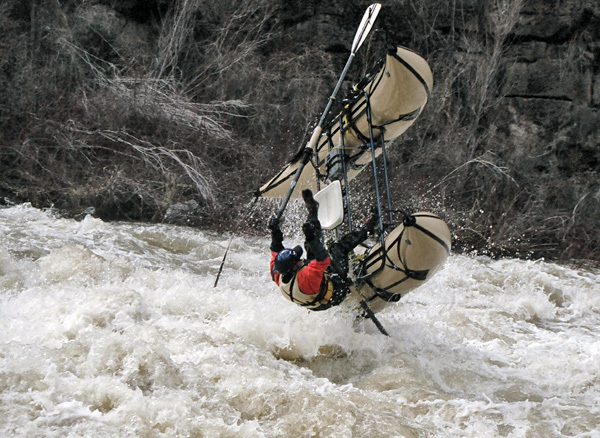 In the end, I had two flips while going big, and there were two catboat flips. I'm not sure who the lucky individual was who picked the correct number of IK flips. On the run, we saw a herd of wild sheep, hawks, a bald eagle, great blue herons, a river otter, mergansers, amazing canyon scenery, and spectacular rapids. This was one of my all time favorite runs as well. 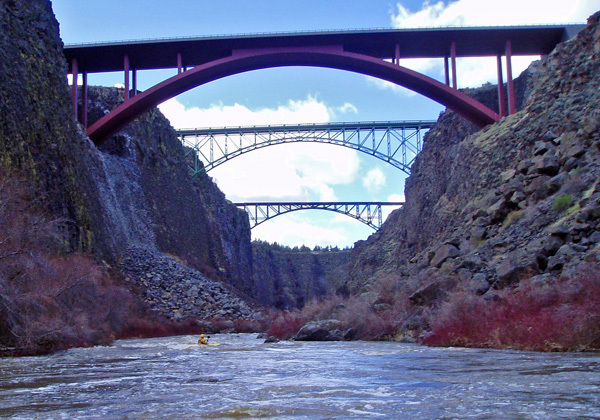 What's not to like about it, great scenery, huge but relatively safe rapids, and a day on the water with lots of friends and really good people.